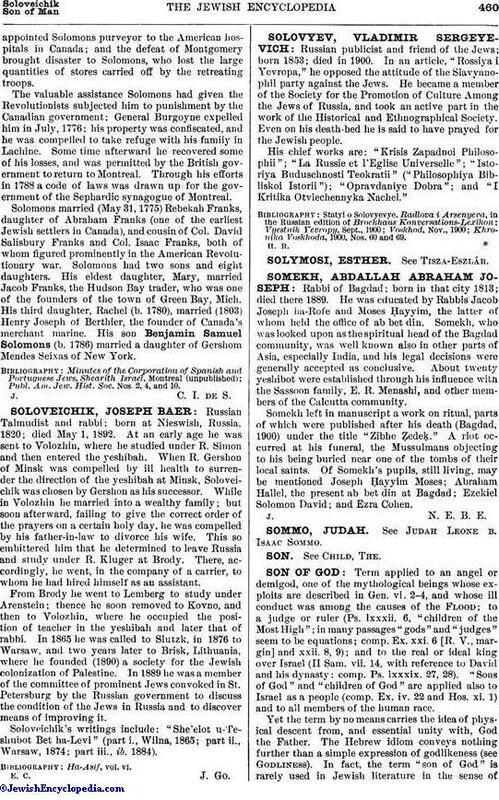 Russian Talmudist and rabbi; born at Nieswish, Russia, 1820; died May 1, 1892. At an early age he was sent to Volozhin, where he studied under R. Simon and then entered the yeshibah. When R. Gershon of Minsk was compelled by ill health to surrender the direction of the yeshibah at Minsk, Soloveichik was chosen by Gershon as his successor. While in Volozhin he married into a wealthy family; but soon afterward, failing to give the correct order of the prayers on a certain holy day, he was compelled by his father-in-law to divorce his wife. This so embittered him that he determined to leave Russia and study under R. Kluger at Brody. There, accordingly, he went, in the company of a carrier, to whom he had hired himself as an assistant. From Brody he went to Lemberg to study under Arenstein; thence he soon removed to Kovno, and then to Volozhin, where he occupied the position of teacher in the yeshibah and later that of rabbi. In 1865 he was called to Slutzk, in 1876 to Warsaw, and two years later to Brisk, Lithuania, where he founded (1890) a society for the Jewish colonization of Palestine. In 1889 he was a member of the committee of prominent Jews convoked in St. Petersburg by the Russian government to discuss the condition of the Jews in Russia and to discover means of improving it. Soloveichik's writings include: "She'elot u-Teshubot Bet ha-Levi" (part i., Wilna, 1865; part ii., Warsaw; 1874; part iii., ib. 1884).